Bury St Edmunds has played a very important part in English history; it was here that in 1214, Barons swore they would force King John to accept the Carter of Liberties, later known as the Magna Carta, one of the most important documents of Medieval England, and was a significant step towards the English democratic and legal systems of today. King Henry VIII’s sister, Mary, is buried in St Mary’s Church and the now ruined Abbey, with it’s magnificent gardens, was a shrine to Saint Edmund, King of the East Angles. Bury has a striking combination of architecture, from medieval and elegant Georgian squares, a glorious Cathedral with it’s stunning Millenium Tower, magnificent gardens, alongside ultra modern facilities. The Moyses Hall Museum dates back to 1180, the Theatre Royal is one of the oldest theatres in England, and The Apex is a new, state of the art live entertainment venue. Interestingly, the smallest pub in England, The Nutshell, is also in Bury St Edmunds. Bury St Edmunds has excellent shopping and a wonderful street market on Wednesdays and Saturdays. Leisure facilities include a multiplex cinema complex, an “arts cinema”, theatres, newly designed leisure and fitness centre, great restaurants, pubs and cafes, in addition to quaint old world shops. 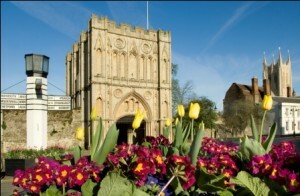 Bury St Edmunds has a population of about 45,000 and is on a direct train line and coach service to London. Bury St Edmunds has seen glory, turmoil and scandal over the centuries of which few small towns could boast. Today it remains a busy and beautiful market town at the heart of East Anglia.